Loft Opening Not Big Enough? Old Inefficient Wood Hatch? Do I need a new loft hatch? You have updated your insulation level to the government recommended 270mm, so what about your badly sealed and inefficient out dated loft hatch? 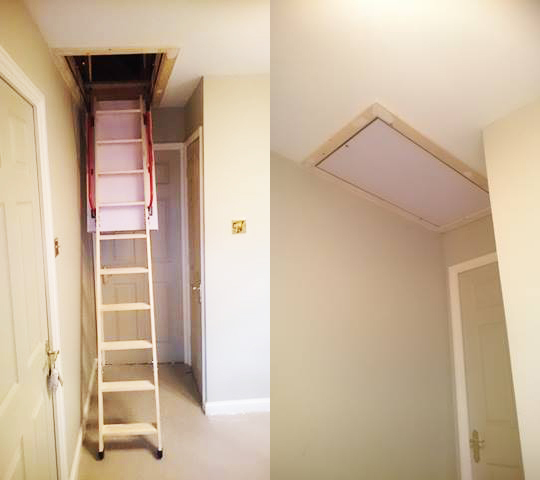 The most important part of retaining heat in your home is to heavily insulate the ceiling area at the top of your landing and update the old loft hatch to a more efficient modern building regulation spec hatch. Your upstairs landing is where most of the downstairs heat ends up and a poor weak loft hatch will just let it all through costing you £100's over the years. There is just no point having a heavily insulated loft and leaving in the old inefficient loft hatch. 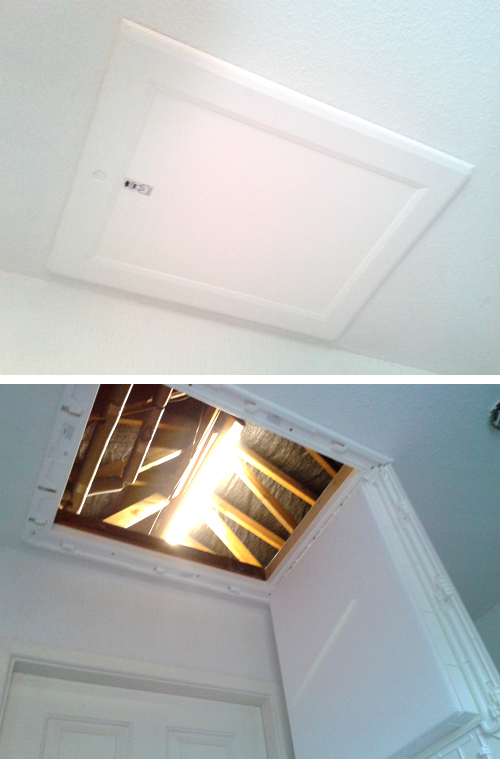 Reverse hinging an old wood loft hatch is no longer seen as good practice as it does not comply with air leakage requirements of Part L of the Building Regulations. We can replace, make larger, move and improve your loft access door (All prices below are including fitting). The revolutionary design of the multi-point catch mechanism means that this door (picture here) can maintain a more effective draught seal around the entire accessible opening, helping to meet the air leakage requirements of Part L of the building regulations and preventing the problem of moist warm air entering. The door is unlocked by hand by sliding to open the catch mechanism. This door can also be used in conjunction with our loft ladders. 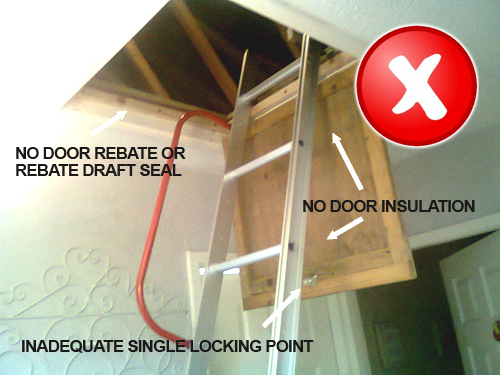 Do you install extra long timber loft hatch and ladders? In some cases we come across customers who need a larger loft opening or may not have the space for a aluminum floor mounted ladder to stow away, so the alternative is to install a larger more convenient loft ladder complete with framed hatch. We can install a timber fold away ladder with frame and sealed door and we believe this is the complete loft-access solution, with an FSC-certified timber loft ladder Measuring (H)1150mm x (W)545mm with spring-assisted stowage and wide, sturdy treads for comfortable climbing. A complete loft access solution including ladder Loft frame surround 26mm insulated trapdoor and spring assisted stowage.